For other people named Alf Boe, see Alf Boe (disambiguation). Boe, the youngest in a family of nine children, was born in Blackpool, Lancashire, and brought up in nearby Fleetwood. He is of Irish and Norwegian descent. His mother and father named him after the Italian name of Pope John XXIII. He attended St Wulstan's and St Edmund's School and Cardinal Allen Catholic High School in Fleetwood. His earliest musical memories were of listening to his father's Richard Tauber records and at the age of 11 he discovered Puccini's La Bohème for the first time. Boe's first public performance, aged 14, was at Fleetwood's Marine Hall in a "Songs from the Shows" presentation organised by inspirational local singing teacher Lottie Dawson. He states that although he sang only a couple of lines he was extremely nervous. At the age of 17, Boe became an apprentice mechanic at the TVR factory in Bispham, Blackpool. He enjoyed entertaining his colleagues by singing opera arias while he polished the cars, and one day was overheard by a client with connections in the music industry who was so impressed that he suggested Boe should go to London and audition for the D'Oyly Carte Opera Company. His audition was a success and he gave up polishing cars to embark on a singing career. Boe has never been able to trace the customer who suggested he go for the audition, having lost the man's business card. Boe moved to London and studied singing at the Royal College of Music, the National Opera Studio and the Royal Opera House's Vilar Young Artists Programme. In 1999 and 2000, he was featured as the "opera dude" on albums by the Clint Boon Experience, led by the former organist of the Inspiral Carpets. In 1999 he sang Ernesto for Scottish Opera in their Opera-Go-Round production of Don Pasquale, touring widely throughout Scotland. Baz Luhrmann, who had spent two years looking for the lead for his Broadway production of La Bohème, approached Boe for the role. Boe subsequently appeared (credited as Alfred Boe) on the 2002 Broadway Cast Recording released by Bazmark Live Pty Ltd. Boe and the other principal leads received a Tony Honors Award in 2003. He has also sung the role at Glyndebourne and the English National Opera. 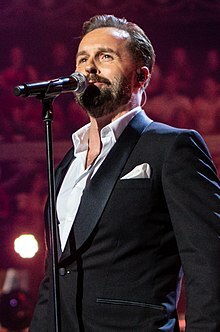 In 2006, Boe was signed to the Classic FM Presents label as their first signing in a new venture for the radio station, and his album Classic FM Presents Alfie Boe reached number three in the UK classical chart. At the 2006 Canterbury Festival, on 27 October, Boe performed with soprano Hayley Westenra at a concert in Canterbury Cathedral. In November 2006 he was signed to the EMI Classics label and his first album on that label, Onward, was released in March 2007. Boe toured the United Kingdom with the Fron Male Voice Choir in February 2007 and took part in the first Classic FM webcast concert with soprano Natasha Marsh in March. The same month, he was appointed as an ambassador of the Prince of Wales Arts & Kids Foundation, a British educational charity working to inspire and educate children by introducing them to the arts. Boe's role being to bring music, and opera in particular for those children involved. In April, Boe starred opposite Lesley Garrett and Willard White in the ITV Music of Morse concert at the Royal Albert Hall. He was also nominated for a Classical BRIT for Best Album, missing out to Paul McCartney at the ceremony on 3 May 2007. Boe also performed with Michael Ball in the English National Opera production of Kismet. His live performance of the song "Stranger in Paradise" from Kismet on the Michael Parkinson show was released as a digital download single on 25 June 2007. In August, Boe realised an ambition to record an album of Neapolitan songs which was released in November under the title La Passione. On 24 August 2007 he performed at the Arundel Festival alongside Natasha Marsh. On 19 October 2007 he performed at Canterbury Cathedral during the Canterbury Festival. Boe also performed at the annual Festival of Remembrance at the Royal Albert Hall on 10 November 2007. On 31 January 2008, Boe performed at the Pleasure Beach Arena, Blackpool, to over 1,600 local children, in a special Music Quest concert to help introduce the classics to a new generation and to celebrate the end of the Music Quest three-year project which was sponsored by the Prince of Wales Arts & Kids Foundation and Classic FM MusicMakers. On 3 October 2010, Boe took on the role of Jean Valjean in a concert performance of the musical Les Misérables at the O2 Arena in London to celebrate the 25th anniversary of the show, released on DVD and Blu-ray Disc. The concert encore performance of "Bring Him Home", credited as the "Valjean Quartet" — Boe with Colm Wilkinson, John Owen-Jones and Simon Bowman (each of whom has portrayed Valjean in various theatrical productions) — was re-recorded at the Abbey Road Studios and released as a charity CD single and digital download on 13 December 2010. On 16 December 2010, Boe once again performed as Valjean in the Royal Variety Performance in front of Prince Charles and the Duchess of Cornwall singing "What Have I Done? ", and "Bring Him Home" again alongside Wilkinson, Owen-Jones and Bowman. Boe appeared as Valjean in Les Misérables at the Queen's Theatre, London, from 23 June to 26 November 2011. His friend Matt Lucas also joined the cast as Thenardier. During his run as Valjean, Boe appeared in the "Les Misérables v Lend Me a Tenor Battle of the Tenors" at Soho's Winnett Street, London on 13 July 2011. In August, Boe performed with the National Symphony Orchestra at Beau Sejour and Gloucester Hall. In 2015, he reprised the role of Valjean in the Broadway revival of Les Misérables at the Imperial Theatre in New York. He succeeded Ramin Karimloo - who played Enjolras in the 25th Anniversary concert - on 1 September 2015. It was announced in February 2019, that Boe will reprise the role of Valjean at the Gielgud Theatre in a staged concert production of Les Misérables. Boe will star opposite Michael Ball (Inspector Javert) and Matt Lucas (Thénardier), with whom he has performed on numerous occasions. The production opens on 10 August 2019, at the Gielgud Theatre. Alfie starred as the romantic lead Billy Bigelow in Rodgers and Hammerstein's Carousel in a limited run at the English National Opera directed by Lonny Price, opposite vocalist Katherine Jenkins. In January 2011, Boe performed for English National Opera in La Bohème and The Mikado. In March 2011, Boe performed three concerts in Idaho: two in Rexburg, and one in Sun Valley. In April, Boe appeared in The Great British Musical – The Famous and the Future at the Criterion Theatre and the St George's Day celebration concert in Trafalgar Square. In May, Boe went on to perform at the Classical BRIT Awards ceremony at the Royal Albert Hall, in the Isle of Man, and then headlined the Hampton Court Palace Festival finale on 18 June 2011. Boe appeared in the BBC Last Night of the Proms concert at the Caird Hall on 10 September 2011 and the Llanelli Choral Society's Grand Performance Concert at Tabernacle Chapel, Llanelli on 24 September 2011. Boe commenced the "Alfie Boe 'Bring Him Home' UK Concert Tour" in Bristol on 6 December 2011, finishing in Gateshead Sage on 4 February 2012. In October 2011, Boe announced that he would be appearing in the Lytham Proms Festival Weekend on 4 August 2012. Tickets went on sale on 14 October 2011. The festival is held in the town of Lytham St Annes close to his home town of Fleetwood. The local newspaper Blackpool Gazette described his concert as a 'homecoming' using the title 'Bring HIM Home'. On 6 May 2012, Boe performed at the Kauffman Center in Kansas City, Missouri. On 4 June 2012, Boe performed at the Diamond Jubilee Concert for the Diamond Jubilee of Elizabeth II. He sang "’O sole mio" leading into Elvis Presley's "It's Now or Never". He also sang, with American soprano Renee Fleming, "Somewhere" from West Side Story, this performance taking place on the balcony of Buckingham Palace. He appeared on The One Show on 30 August 2012. On 2 October 2012, Boe embarked on a major U.S./Canada concert tour starting in Dallas, Texas, ending in Toronto on 29 October. In December 2012, Boe was featured as a guest artist for the holiday concert series of the Mormon Tabernacle Choir, Orchestra at Temple Square and Bells on Temple Square. The concerts also featured legendary broadcaster Tom Brokaw who narrated the story of Gail Halvorsen (who also made an appearance) and the candy bombers of the Second World War. Boe performed several Christmas favourites as well as 'Bring Him Home'. The live performances were recorded and released as Home for the Holidays feat. Alfie Boe. Boe returned to the US in late January 2013 for a short (8 cities) tour, starting in Albany, New York 27 January and ending in Pittsburgh 9 February. In February 2013, Boe, colloquially known as the Lancashire Michael Bublé, was awarded two platinum albums by the BPI for Alfie (2011) and Bring Him Home (2010). Back in the UK, Boe did a three-week, 14-city tour, which started in Birmingham and ended in Belfast, Northern Ireland. On 15 April 2013, Boe was awarded a Fellowship of the Royal College of Music from his Alma Mater. On 26 May 2013, Boe sang "Bring Him Home" at the U.S. National Memorial Day Concert on the West Lawn of the Capitol in Washington, D.C.
On 9 May 2015 he performed at VE Day 70: A Party to Remember in Horse Guards Parade, London. On 4 and 5 June 2015, Boe performed two concerts at Symphony Hall with the Phoenix Symphony, filling in for Colm Wilkinson, who was forced to drop out due to illness. Boe appeared as music-hall singer Richard Chapman in an episode of Mr Selfridge. In 2016 & 2017, Ball and Boe appeared in two ITV Specials, the first being Ball & Boe: One Night Only and the second being Ball & Boe Back Together. In December 2017, Boe replaced Aled Jones as presenter of Christmas Carols on ITV. On 3 March, Boe performed in 'The End of the Show Show' on Ant & Dec's Saturday Night Takeaway alongside Michael Ball. Boe met his wife Sarah while rehearsing La Bohème in San Francisco. They have two children, daughter Grace and son Alfred Robert. He is a member of the Grand Order of Water Rats. ^ a b Carlson, Erin (19 September 2012). "Tony Winner Alfie Boe Could Revive 'Les Miserables' Role on Broadway". The Hollywood Reporter. Retrieved 11 June 2014. ^ "Alfie Boe". Archived from the original on 30 April 2011. Retrieved 14 July 2011. ^ "Alfie Boe Will Replace Tony Yazbeck in Finding Neverland; Sally Ann Triplett Steps In for Sandy Duncan". Broadway.com. Retrieved 2016-03-19. ^ Morgan, Clive (2016-10-18). "Alfie Boe and Michael Ball join forces for album and premiere video for Together". The Telegraph. ^ a b "Royal honour for Fleetwood opera star". Blackpool Gazette. 2007-03-15. Retrieved 2008-03-02. ^ Kate Kellaway (30 May 2010). "Alfie Boe: 'The Pearl Fishers is what opera should be about' | Interview | From the Observer | The Observer". London: Guardian. Retrieved 2013-08-06. ^ Joanna Moorhead (2013-02-17). "Alfie Boe: Former car mechanic turned tenor, 39, on his noisy childhood and tricky departure from opera | Mail Online". London: Dailymail.co.uk. Retrieved 2013-08-06. ^ a b Ettridge, Lisa (2008-01-31). "Fylde-born star gets hero's welcome". Blackpool Gazette. Archived from the original on 1 February 2008. Retrieved 2008-03-02. ^ a b c d e "Superstar hope for Fleetwood tenor". Blackpool Gazette. 2006-11-18. Retrieved 2008-03-02. ^ "The DNA-List: Alfie Boe". The DNA-List with Danny Wallace. 2008-09-21. Classic FM. ^ "Alfie Boe tours the Highlands". Opera Scotland. Retrieved 2011-08-07. ^ "Star Alfie dreaming of a chart success". Blackpool Gazette. 2006-09-08. Retrieved 2008-03-02. ^ "HWI Archives 1996–2009". Hayley Westenra International. Retrieved 2012-01-28. ^ a b c d Duke, Robin (2007-10-08). "Another string to his Boe". Blackpool Gazette. Retrieved 2008-03-02. ^ "Sting on Classical Brit shortlist". BBC. 2007-04-02. Archived from the original on 12 April 2008. Retrieved 2008-03-02. ^ "McCartney scoops Classical Brit". BBC. 2007-05-04. Retrieved 2008-03-02. ^ "Arundel Festival events at the castle". Arundel Festival. 2007. Archived from the original on 2007-10-10. Retrieved 2008-03-02. ^ "Arundel Festival!". BBC. 2007-07-03. Retrieved 2008-03-02. ^ "Check out this year's Canterbury Festival!". BBC. 2007-08-22. Retrieved 2008-03-02. ^ Halstead, Tom (2007-11-06). "Alfie's in demand at Royal Albert Hall". Blackpool Gazette. Retrieved 2008-03-02. ^ "Matt Lucas signs up for more Les Misérables". BBC. 2011-02-23. Archived from the original on 24 February 2011. Retrieved 2011-02-26. ^ "Alfie Boe Sets Broadway Return as New Star of Broadway's Les Misérables | Playbill". Playbill.com. Retrieved 2013-08-06. ^ "Alfie Boe in the buff". Simply The Betsy. 2014-11-11. Retrieved 28 November 2016. ^ "Honours and fellowships | Royal College of Music". Rcm.ac.uk. Retrieved 2013-08-06. ^ "Alfie Boe subs for Colm Wilkinson with Phoenix Symphony". Retrieved 2015-06-06. ^ "Alfie: My Story eBook: Alfie Boe: Amazon.co.uk: Kindle Store". Amazon.co.uk. Retrieved 2013-08-06. ^ "Alfie Boe". Grand Order of Water Rats. Retrieved 21 August 2018. ^ "Home for the Holidays Featuring Alfie Boe". 1 October 2013 – via Amazon. For Franz Lehar: Love was a Dream: "Chart log uk: new entries update". Zobbel.de. Retrieved 2013-08-06. ^ "Classic FM presents Alfie Boe" – via Amazon. ^ a b c d e f g "British album certifications – Alfie Boe". British Phonographic Industry. Retrieved 20 November 2016. Select albums in the Format field. Type Alfie Boe in the "Search BPI Awards" field and then press Enter.